One of my favorite features in Adobe Camera Raw 6.3 (part of Photoshop CS5) is the Lens Correction tool. It's handy for correcting images from your glass that records a tad too much distortion, chromatic aberration, or vignetting. But I also like to use it to evaluate zooms that I'm testing for reviews or considering for purchase. For most common zooms, all you have to do is open the file in Adobe Camera Raw, click on the Lens Correction tab, then check the box next to Enable Lens Profile Corrections. By checking and unchecking the box, you have another way to gauge the performance of the optics on your camera. Adobe Camera Raw Lens Correction Off. Click on image for full size version. 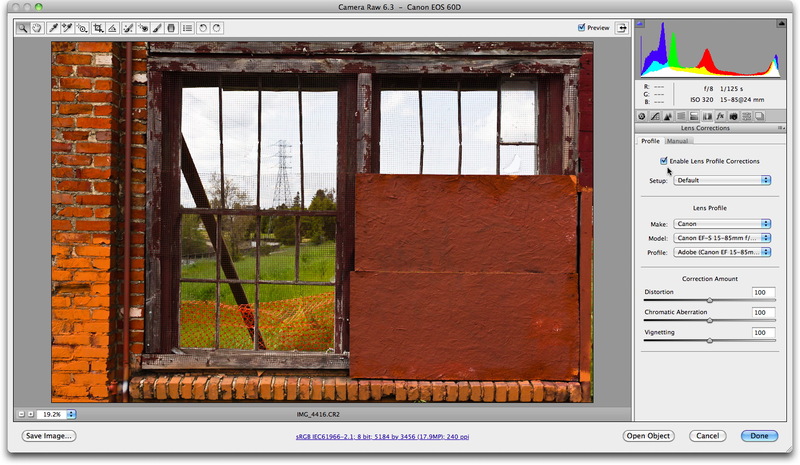 Adobe Camera Raw Lens Correction On. Click on image for full size version. I recently field tested the Canon EF-S 15-85mm f/3.5-5.6 IS USM, and loved the shots it produced in the field. So I thought I'd take a look at how it fared in ACR. As you can see, there was some distorition, but nothing that caused my affection to wane. Lightroom 3 has this same technology available in the Develop module. Look for Lens Corrections in the right-side pane. In either application, this is a useful tool for correcting images and evaluating your glass.